“I want to get better about writing reviews” is a good goal. “I want to identify what’s keeping me from writing reviews and fix that” is a better one. Moving from a good goal to a better one is partially a state of mind, but willpower can’t solve everything. For that, you need an analytical mind and Excel. First, start with a little self-evaluation. Why haven’t you written a review this week? This month? This year? Have you written down any observations at events? What’s preventing you from recording those observations as reviews? What kind of event was it? What level was the person you reviewed? What role were you at this event? When did you write the review? What is the readability of your review? How many distinct observations did you include? Did you provide verbal feedback to your subject? Using Excel to catalog your ideas with this data will give you an organized and thorough inventory of the reviews you’ve written this year. Neat. But does this data make you better about writing reviews? It does not. But it can. Here’s the problem: most of that data is just noise. But some of that data is directly related to factors that prevent judges from writing reviews. Do you tend to procrastinate? Track your review dates. Do you dislike writing? Maybe word count is relevant. Identifying data points that track whatever is preventing you from being the reviewer you want to be are called Key Performance Indicators, or KPI. Your KPI are uniquely selected to solve what problems for you. Maybe you think you’d be a better reviewer if you weren’t intimidated by reviewing higher-level judges. Maybe you realize you could be more proactive about reviewing your team when you team lead. Maybe you feel intimidated by writing in the first place. Look at the data, figure out what you’d like to do better, then select 2 to 4 KPI that will track how you are doing…and don’t stress the rest of the numbers. Once you know your KPI, figure out what those numbers look like for the past, and what you think they’ll look like in the future where you’re becoming a better reviewer. Although I wrote consistent reviews for the main events, I was terrible about writing reviews of side events after Grands Prix and Opens. Because I worked back-to-back-to-back events frequently, I let events pile up and prevent me from writing reviews for the earlier events. Especially self-reviews. Consistently write at least one review every day that I judge. Write a self-review for every Grand Prix or Open. Write reviews within two weeks after the event. 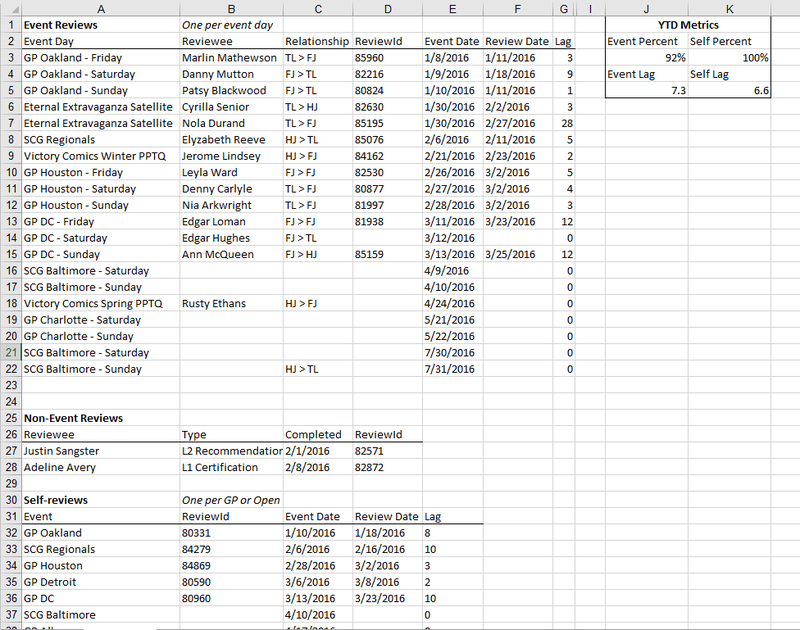 My spreadsheet* includes all the data that I might care about for my reviews this year. The few key data points necessary to track my KPI appear prominently in the top right: percentage of reviews written and their lag time in days. I’ve admittedly included other data, and that data can feel like noise. But in case I decide I’d like to reference other data later, it’s easiest for me to keep it here. Through the magic of formulas, I can see at a glance how I’m doing. If those percent numbers get below 90%, I’m motivated to catch up and write some reviews! And if a lag number goes above 14 days, I look over my upcoming event calendar to see if I’m overscheduling myself. You don’t have to be an Excel wizard to create a Feedback Dashboard. Most of the formula work can be found on Google. The real work is ongoing: taking an honest inventory of your areas for improvement, using your KPI to create goals, and tracking those goals as a means of self-motivation. Don’t be afraid to set aggressive targets, or to use KPI that aren’t flattering – setting only goals that you know you’ll crush will not be as useful for you as setting goals that stretch your abilities. At the end of the year, you’ll want to look back at your dashboard (call it a review year-in-review) and see whether you met your goals, as well as evaluate your goals for next year. It’s important to periodically evaluate your goals, your progress toward them, and whether the KPI you’re using are genuinely measuring that progress. Maybe you’ll find a new axis to look at the same problem, or maybe you’ll find a new goal and have to determine how to measure it. Either way, you’ll have the satisfaction of using data as a tool to get feedback on your feedback. *No, those aren’t real people – for the privacy of those reviewed and for screen space, I’ve changed a few things.